In the final book of the Twilight series, Breaking Dawn, Bella and Edward get married. Bella, whose parents are divorced, has never really seen marriage as a desirable life goal, doesn’t want people to think she’s pregnant and she worries about branding herself a desperate, vapid girl insistent on getting married right out of high school. Certainly nothing says “commitment” like forsaking humanity and spending eternity with someone, so what’s the point of a wedding? Old-fashioned Edward, however, wants to be married, and Bella comes around to his point of view, starting to consider it natural and happy for two people in love to be married, and to heck with the gossips and disapproval of society and her family. She keeps thinking of Anne of Green Gables, of the simpler time she associates with when Edward would have been young, of the high-necked blouse and long skirt she would wear. Bella guesses that the inspiration was from 1918 when she sees her dress, Alice replies more or less and Liana tears her hair out. Here I thought we were using an Anne-centric timeline, but only in the miniseries did Anne get married during the First World War — in the books, Anne got married in 1890, according to this page, and WWI was her daughter Rilla’s turn as a heroine. So what does Bella’s dress look like? Victorian-style clothes play a large role in her fantasy of simple romance, and she says, looking at the dress, that it’s just what she imagined. Yet, a dress from 1918 probably wouldn’t have that Victorian high neck, or maybe not even the long skirt. It must also be noted that 1918 is when Edward was transformed into a vampire at the age of 17, so a dress from this age would probably appeal to him more than something his mom would have worn. 1918 would also be about right, if Bella’s mother, who thought the gown looked like something from a Jane Austen novel, was a hundred years off. Then Alice was stage-managing the whole thing, and I have a really hard time seeing her send Bella out in an unfashionable wedding dress. No one does high necks anymore, not even LDS members going for modesty, and long sleeves seem to be relegated to the Éowyn look. So what exactly do we have here? An Anne-style 1890 gown with puffed sleeves? A streamlined, more fashionable but still modest 1918 gown? A modern dress with vintage touches? I’ve been trying to decide for the last week. So yeah, at this point I think I may have pondered the dress — possibly overthought the dress — more than the author, and it’s been maddening. Maybe it’s like the prom dress: however you see it is right. (Witness the range of Twilight wedding dresses on deviantart.) That means I’m going to stop trying to come up with something perfect and just go with a pseudo-1890s gown, taking Bella at her word that she wanted to dress like Anne and got her wish. But you could just as easily assume that Bella only saw the miniseries, so maybe I’ll draw a 1918 gown too, another day. Trying to combine the two — yeah, I got some pretty funny sketches out of the idea, but I think I’ll pass. 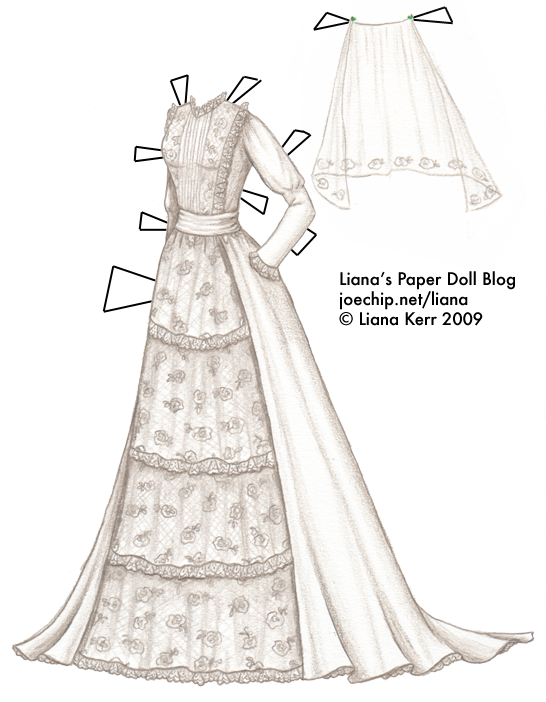 In my sketches of this dress, she has her hair down and even though it’s old-fashioned, it’s still romantic and sweet. So I read Twilight a while back, after reading about how it was the hot new thing for starry-eyed young girls and their unappreciated mothers. (I had to go through a waiting list of about 114 people for it, too.) I admit that I enjoyed it, in the same way I’ll admit to liking Naruto — it’s definitely shallow, artless wish-fulfillment, but that straightforwardness in and of itself makes it rather sweet. Also, Edward reminds me of Brian in one respect, in that he’s always teasing me about something or another. Beyond that the comparisons are few, but between me and Bella, I’ve got the better guy. The criticisms of the book depicting really lousy relationship behaviors as desirable, Bella and Edward being Mary Sue characters (e.g. entirely perfect — clumsiness is not a character flaw, thank you), Bella being a moron (I don’t agree with that one, I felt like she was depicted as a book-smart, classics-reading, aloof old soul) and so forth have been addressed at length elsewhere, I’m sure, so I’ll stick to what I know — what? no good dress descriptions? Bella is always wearing things like jeans and flannel, or a brown turtleneck or some such monstrosity. What’s the fun of a proper vampire romance if you’re wearing flannel? The only fancy dress she gets comes in at the end, and isn’t very well described besides being hyacinth blue and off the shoulder. On Stephenie Myers’ website is a cut first draft of the dressing for prom scene, in which the dress gets a little more attention. It wouldn’t work for my paperdolls since I don’t do see-through fabric (so Sylvia and Iris, as well as any other skin colors I draw, can both wear anything), but even if I did, even after much musing on the relevant paragraph, I’m not sure quite what to make of the description. Mostly I’m stuck on the sash at the waist, which is “paled-flowered, hyacinth fabric, that pleated together to form a thin ruffle down the left side” and then goes on to be long at the back and open at the front. Rosalie calls it haute couture, and given that a lot of haute couture is a little beyond me too, maybe the problem is on my side after all. 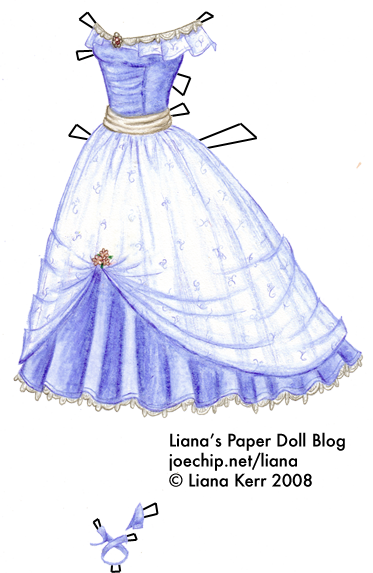 But anyways, that dress is merely from the first draft; I decided on my own version for the paperdoll. For that is the appeal, after all, to put yourself in the heroine’s shoes and stunning gown, imagining yourself the target of slavish devotion from the perfect man. I like it that way, because a quick search through DeviantArt will show as many Bella prom dresses as there are Twilight fanartists, all the way from “her dad wouldn’t let her out of the house wearing that” to full-on medieval princess. Even the movie’s version looks nothing like the others. Me, I envisioned the dress as somewhere between a 1950s party dress and something out of Gone With The Wind, and so that’s what we have here. I probably won’t go see the movie – I’ve got enough vampirism in my own house. Anyways! I think the last two polls are pretty clearly over, so let’s start the Grand Halloween Showdown!